After high winds over the weekend, Monday morning’s beach was littered with shells, algae, and… crab traps. Sea school campers joined the myriad of people releasing the crabs from the wire traps that had washed onto shore, first shaking the crabs out of the trap, then holding them behind the claws to release them into the waves. 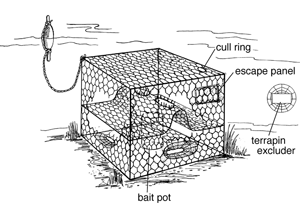 These traps primarily held blue crabs, a species that is endemic to the region, ranging from Massachusetts to Argentina. Introduced via ballast water, blue crabs are invasive in the Baltic, North, Mediterranean, and Black Seas. After hatching, blue crabs undergo seven planktonic, larval stages, during which they float, feeding on microorganisms. Once they reach brackish water (fresh water mixed with ocean water), the crabs become adults. For further growth, they molt, shedding their hard exoskeleton and rebuilding a larger one each time. Females mate only once in their life, during their final molt, although they can spawn several times. After spawning, they retain the fertilized eggs in an egg mass, until releasing the larva in the mouth of a river. Blue crabs range from Massachusetts to Argentina. Blue crabs are an important commercial species. In Florida, ten gallons of blue crabs can be harvested per person per day, although egg bearing females cannot be harvested. There are many traps set off of Sanibel’s beaches. Pig knuckles, used for bait, often wash onto the shore from these traps. Each trap is labeled with a fisherman's identification information, so if it washes ashore during a big storm, it can be re-claimed. Another crab caught in the traps we found was the Florida stone crab. Ranging from Connecticut to Belize, this species lives in shallow water habitat where individuals dig holes up to three feet deep. Stone crabs lose their limbs easily, and can regrow them. Unlike the harvesting of blue crabs, only stone crab claws that are over 2 ¾ inches are taken. Their bodies are small and not highly prized, while the large strong claws are considered a delicacy. Only one gallon of claws per person or two per boat can be harvested per day. Stone crabs can regrow the lost claws, although experiments indicate that mortality rates are high. Crabs support an important industry in Florida, but they are also fascinating animals. Freeing the crabs was a fun opportunity to help marine life and to see these interesting creatures up close.